Create bold definition with extra length, volume and a slightly denser lash. HOW TO APPLY 1. Lay on top of your natural lash to check fit. If strip extends beyond your lash line, trim from the outer edge by cutting in between knots for your best fit. 2. 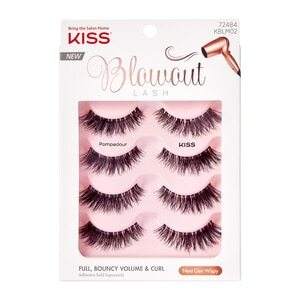 Apply KISS Strip Lash Adhesive to the lash band; wait 30 seconds for adhesive to become slightly tacky. 3. Apply lash along natural lash line, tapping into place. Hold as adhesive fully dries.